There are 7 blog entries for November 2017. Wednesday, November 29th, 2017 at 9:57am. I hope you had an awesome holiday! I had many family members ask for more tips on how to improve the value of their home so I'm excited to get back. Last time I wrote about the power of paint, and gave you some great color samples. This week I want to go over how to update the hardware in your home. If you have outdated light fixtures and want to update you're in luck because this is an easy fix! A lot of homes have outdated dome lights, these can be replaced with recessed lighting and updated fixtures to make your home look sleek. I suggest recessed lights in hallways and over the kitchen sink, and replacing the decorative ones in key areas of the home with updated versions that appeal to you. Why all the fuss about Thanksgiving? Wednesday, November 22nd, 2017 at 2:29pm. It's been a while since I wore a tall black stiff paper pilgrim hat with a faux golden buckle on front or donned a simple head band made of brown paper grocery sacks with glued on dime store feathers in a Thanksgiving elementary school play... So, I thought I would brush up on the meaning of Thanksgiving. I found an entertaining (and seems to be accurate) account of our history on a website called Politifact.com It was a quick read and explained more than I was looking for. Click here for the full article. Wednesday, November 15th, 2017 at 9:23am. Now for the fun part...the interior! There are endless possibilities when updating to improve the value of your home but never underestimate the power of paint! Painting is a simple and inexpensive project that can change everything. Warm, neutral colors are best. Try to stay away from bright, bold colors except for an accent. Taupe is a popular color, but I personally love and recommend the 2017 Sherwin Williams Color of the year, Poised Taupe. I recently used it in a bedroom and it's an amazing mix between brown and grey. Grab a can of paint and let's do this! Thanks for reading and stay tuned for more next week! Thursday, November 9th, 2017 at 6:08pm. Happy Holidays! This is officially my favorite time of the year, and I hope it is yours too! On the blog today I would love to share some of my favorite holiday activities that are available here in BCS! Wednesday, November 8th, 2017 at 11:15am. Continuing with the exterior, as discussed last week basic maintenance on your yard is a quick and simple way to create curb appeal, which can have a return of 3-5%! Simple tasks like adding new mulch to flower beds, keeping the yard mowed and trimming overgrown shrubs can make your home look clean and fresh. Not only is yard maintenance important when looking to improve the value of your home, but the cosmetics that make it up can make a world of difference. 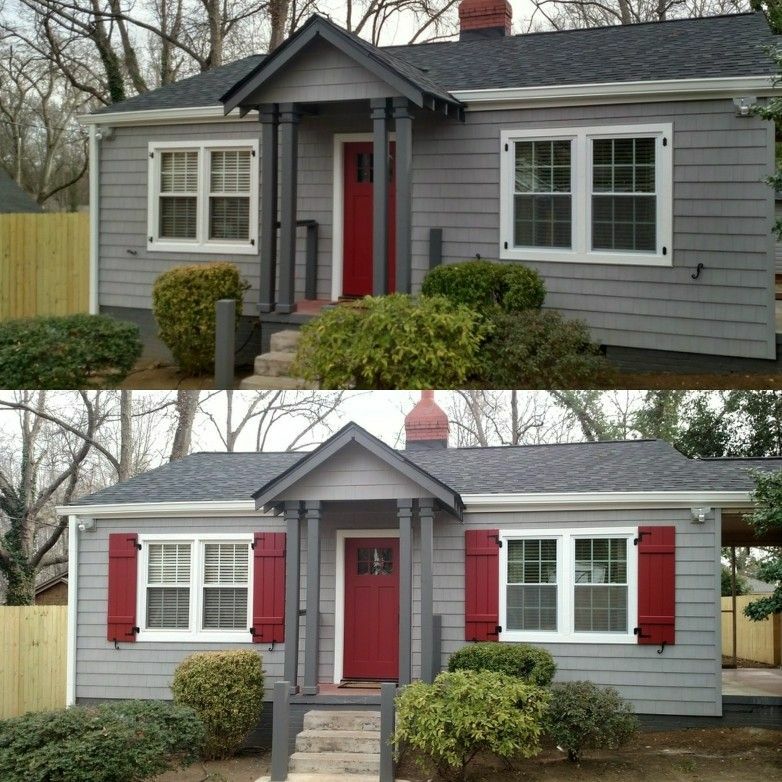 Adding shutters to windows and replacing the front door is an affordable and easy way to update. Not only does replacing the front door add another level of security but can have a return of 51%! That is major! Stay tuned for more tips on how to increase the value of your home! Thursday, November 2nd, 2017 at 11:11am. Wednesday, November 1st, 2017 at 10:15am. If you are in the market to buy a home, give me a call at 979-324-9992. I am an ABR® and would be happy to help you find the perfect property.